Between classes at Harvard, the lunch line traces the class line dividing the country’s most elite campus. A dining hall staffer could serve the university president lunch for about 35 years and on the current wage scale, still earn less than his boss’s 2014 annual salary. And while Harvard thinks the demand for a yearly minimum wage of $35,000 is too indulgent, students pay over twice that much to the school to attend classes and live on campus. So that’s why both workers and students ditched the lunch line for the picket line lasts week in the first Harvard campus strike in over 30 years, transforming the polished Oxonian dining halls into a crucible of intersecting social struggles. After the strike launched last Wednesday, a Harvard spokesperson stated the university was “disappointed that they have been more interested in planning a strike than working on a solution that meets the needs of their members and the wider community.” Workers are disappointed that the richest university in the country seems more interested in fattening its $35 billion endowment than sustaining a living wage for its poorest workers. According to an analysis by Harvard Medical students, under the administration’s proposal premiums could reach roughly $233 per month, compared to a zero premium under the Affordable Care Act in Massachusetts—a costlier plan than what many uninsured, non-union workers in the state enjoy. Workers, however, think their union contract should provide more. Their contracts mark a last line of defense against a university-wide cost-cutting trend that has already shaved down benefits for nonunion professional employees. With the picketing stretching into week two, Ten Eyck says that across Harvard’s community, “the feeling of the strike has been that we have everyone but the administration on our side.” Though some students grumbled about inconveniences of limited menu options and dining halls run by a management-led skeleton staff, many have donated to strikers and used their swipe cards to stage a “dine-in” outside to share with them. 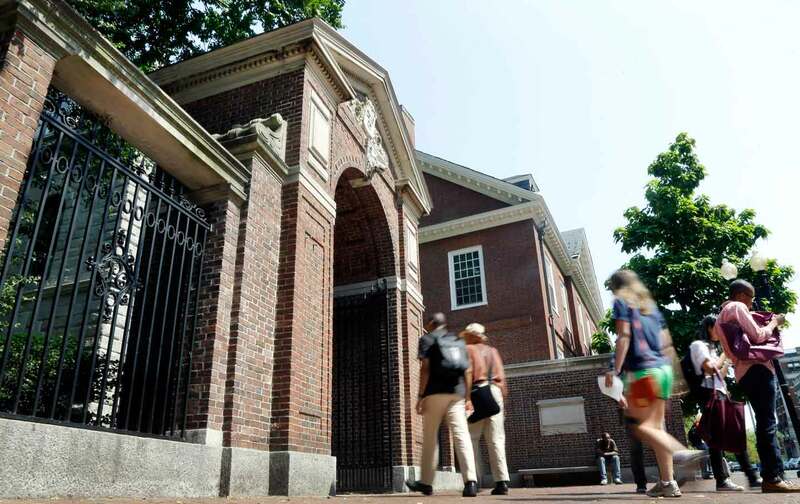 On the other hand, students too feel the weight of Harvard’s inequality. Over the past year students of color have protested the institution’s glaring lack of socioeconomic diversity and its failure to think critically about its history of segregation. The faculty, too, is cleft between an increasingly scarce tenured professoriate on top, and the much-lower-paid academic precariat, including graduate-student instructors, who are themselves fighting for a union. The dining-hall staff represent an increasingly rare sliver of the “real world” on campus—many of them are immigrants and people of color who commute from far away because they can’t afford Cambridge rents. The labor dispute reflects a new normal in higher education. According to a sector analysis by the Delta Project, at both private nonprofit schools and public schools, frontline workforces have shrunk dramatically, while professional and executive staff have swelled. However, “the proportion of spending dedicated to compensation remained steady across most types of institutions” since 2002, so benefits alone aren’t consuming the budget. Though Harvard’s endowment is astronomical, the strike resonates deeply with growing labor tumult on other campuses that are facing far more dire financial straits than Harvard, with many forced to slash budgets, cut back on courses and services, and cut staff and faculty positions since the recession, while tuitions and student debt loads swell. Over the past year, service workers as well as faculty have protested over wages and labor conditions at various public and private campuses: Unionized faculty at City University of New York and California State have threatened to strike, and both union and non-union academic and campus staff workers have rallied—with support from student activists—against threatened mass layoffs and benefit cuts at University of Pittsburgh and University of Tennessee. And while Columbia graduate-student teachers and researchers campaign for union representation, Columbia’s Student-Worker Solidarity coalition protested for a $15 minimum wage for all workers on campus, students as well as staff.